Curbtender Sweepers LLC is a leading manufacturer of mechanical street sweepers and regenerative air sweepers. The company holds over a dozen patents and multiple PM10 certifications. 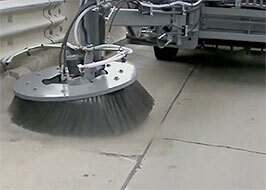 At Curbtender, we believe in manufacturing sweepers that are built to last, not designed to fail. We believe in giving our customers more control, more capability and more standard features than any other sweeper out there. 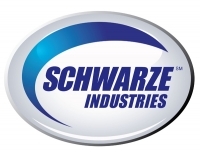 When you check out our product line we believe you'll see the difference. 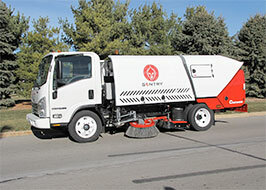 All Curbtender Sweepers utilize multi-plexed, CANBUS controls. These advanced and highly customizable controls allow the service technician to quickly analyze all sweeper electronics. The CANBUS control system also greatly reduces the amount of wires in the wire harness. The Centurion® is a single engine, mechanical street sweeper capable of operating at PM10 compliance without the use of water spray. The Centurion can contain particulate matter without spraying water, so provides the capability to keep running when the 300-gallon water tank runs out. Alternatively, this feature is uniquely suited for drought zones where water usage is limited. The Centurion’s patented dust containment system utilizes shrouding and skirts as well as a vacuum-assist to control dust. The exhausted air from the vacuum operation is first filtered through 256 square feet of synthetic filter material. Use this link to find out more. 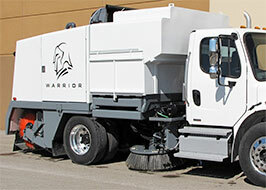 The Gladiator is a PM10 Certified dual engine mechanical street sweeper. The Gladiator is a champion in the toughest conditions. Its simple and rugged design makes it the ideal sweeper for construction jobs, mainline sweeping, and heavy debris situations. 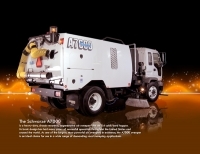 A 74HP HATZ Tier IV Final auxiliary engine powers the 44″ gutter brooms and 60″ main broom. Debris is shoveled into the hopper by a squeegee-type conveyor system with replaceable flights. The 5.0 cubic yard hopper (4.0 material capacity) is more than capable of handling big jobs. Dust is suppressed by the Gladiator’s customizable 340 gallon water spray system. The gutter brooms have easy in-cab control of speed, down pressure, tilt, and water spray. To see the Gladiator's dedicated web page, click here. The Warrior’s powerful 68″ rear broom pushes dirt onto the conveyor’s solid synthetic rubber belt and is then carried by angled cleats into the hopper. No debris is falling between the cracks on this conveyor thanks to the gradual incline and solid belt design. For more information on our Warrior model, check out this web page. 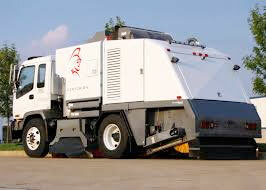 The Sentry regenerative air sweeper does not require a CDL. While small in weight, it still handles a serious load. One or two 34″ gutter brooms spread out up to 12 feet to move debris towards the center of a 77″ vacuum head. The 31″ diameter fan draws debris into the Sentry’s large 4.5 cubic yard hopper. Meanwhile, the 200 gallon water tank and dust suppression system helps keeps dust to a minimum. 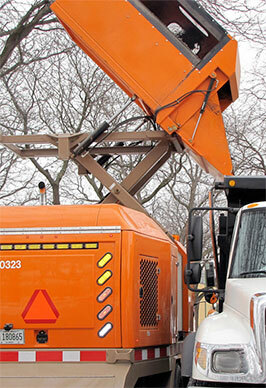 When fully loaded the hopper dumps at a height of 70″, tall enough to load into an on-site commercial dumpster. The Sentry comes equipped with a unique pickup head with a crescent-shaped leading profile. This design allows certain debris type, like plastic bottles, to collect towards the center of the pickup. 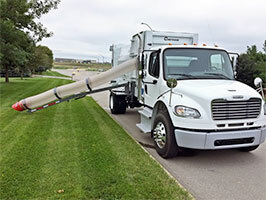 For complete information, check out the Sentry on the Curbtender website. Do you know about Curbtender's innovative Vanguard removable, front-mounted, broom attachment with mounting options for trucks, street sweepers or skid steer units? The Vanguard has the capability to travel side-to-side, control gutter broom tilt, adjust gutter broom speed and rotate in either direction. This makes the Vanguard the ideal attachment for a variety of applications. Tilt the gutter broom to an angle and use it to dig out road surface grindings. Flatten the gutter broom out and decrease the speed to move gravel off of the road and back onto the shoulder. Max out the speed and adjust the gutter broom angle to remove paint striping! Or, mount the unit to a street sweeper and use the Vanguard to provide extra distance away from highway dividers. Here is where to find out more, including a video where you can see the Vanguard in action! In addition to its line of sweepers, Curbtender also makes a great leaf collector — that doubles as a waste hauler! Our versatile VacPak is a compacting leaf collector that can do double duty as a trash hauler. It's a multi-purpose collection vehicle that every municipality can use. The VacPak is a side-loading refuse truck specifically designed for organics collection, food waste collection, yard waste collection, and rural or small-route refuse collection. The vacuum package is a bolt-on attachment that can be added or removed for seasonal collection of leaves. Unlike traditional leaf collection machines, the VacPak is able to maximize the amount of leaves collected thanks to its packing mechanism. For most of the year this packing mechanism can be used to maximize trash payload. But during the fall months, its packing force helps to push the leaves into a condensed load as the vacuum pulls more leaves into the body. Find out more and watch a video of the VacPak in action on the Curbtender website. 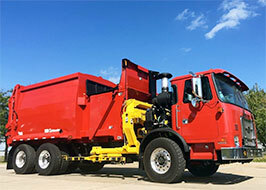 Curbtender additionally is a leader in refuse collection trucks with over 35 years of experience manufacturing automated side loaders. All municipalities need to know about our HammerPak garbage trucks. The HammerPak is an inherently simple automated side loader designed with fewer moving parts and less hydraulic components. The HammerPak is named after its patented packing mechanism which features a hammer-like packing panel. The packing panel pivots forward and backward inside a curved hopper, much like the swing of a hammer. With this design, the packer makes a “clean sweep” with every stroke and eliminates the need for a hopper clean-out door. The HammerPak is rated for 700 pounds per cubic yard compaction. Here is where to find out more. Questions? Ask The Curbtender Team! We look forward to answering all of your questions. Give us a call at 319-266-1721 to learn all the details about the Curbtender product line. Find out for yourself why Curbtender is a solid choice when you require any of the product types we manufacture. 606 A & B Performance Rd.